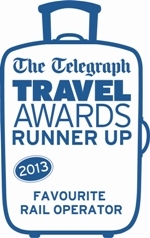 Thank you to all who took the time to vote for Ffestiniog Travel in the Telegraph Travel Awards 2013. We were delighted to be one of three companies to be shortlisted in the Best Rail Tour Operator category. We beat off tough competition (a record 75,000 votes were cast across all categories), but we received enough votes from you and other Telegraph readers to go head-to-head with the Orient Express and Rocky Mountaineer at the awards ceremony based at the Shard in London on Wednesday 27th November. Former MP and TV personality Gyles Brandreth presented the awards and took the time to share his own, flattering views of Ffestiniog Travel in this video. Unfortunately we lost out to the Orient Express who took the prize, but we took comfort in the fact that we were in good company, sharing centre stage with such prestigious nominees as the Orient Express and Rocky Mountaineer. Presenting the award to our General Manager, Maria Cook, Gyles Brandreth added his own personal plaudits for Ffestiniog Travel. Our recent email encouraging you to vote for us certainly paid off and we are very grateful for your support. Your loyalty did not go unnoticed by the Telegraph in its follow-up piece after the awards ceremony. "Ffestiniog Travel has built up a loyal clientele with its escorted rail tours and bespoke rail-based booking service. Besides the more common tours of Switzerland and Austria, Ffestiniog Travel visits smaller countries such as Kosovo, Macedonia, Romania and Vietnam. Clients have the warm feeling that profits go to support the heritage Welsh Highland and Ffestiniog railways." We hope some of you have been rewarded for your loyal votes and won one of the 22 luxury prizes, worth £170,000, offered by the Telegraph when you voted for your favourite rail operator. It would have been fantastic to have won, but there is always next year so we may be calling on your votes once again. 2014 is a special year for Ffestiniog Travel, our 40th anniversary year, so it is always wonderful to receive recognition for the products and services we provide from the people that matter most to us – our customers!